At least 8 people died when fire gutted a garment factory in Bangladesh on Wednesday, just two weeks after a building collapse killed more than 1,000. Doubling the pay of Bangladesh's hard-pressed garment workers would add just a few pennies to the cost of a t-shirt, U.K. unions said Friday. 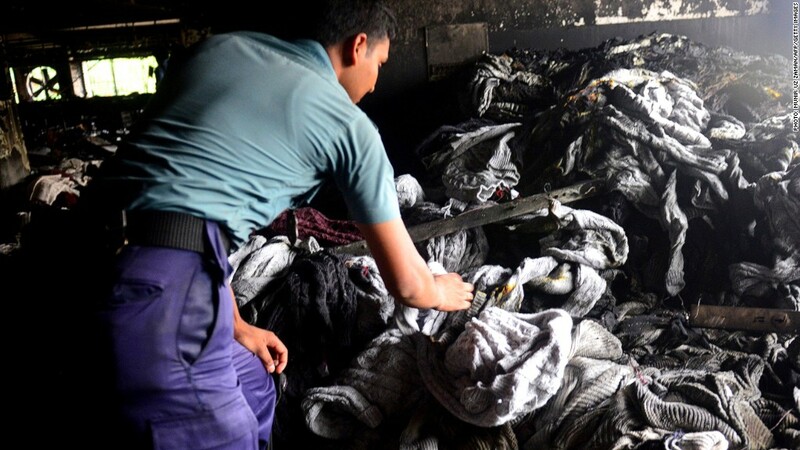 Bangladesh is facing growing international pressure to improve conditions for workers at its garment factories after a series of fatal fires and a building collapse last month that killed over 1,000. The Trades Union Congress, an organization representing most of the U.K.'s six million unionized employees, said blaming unsafe conditions and "poverty pay" on bargain-hunting by consumers was wide of the mark. "Wages paid out to the thousands of women who work in the clothing factories are just a tiny fraction of the end price we pay at the till," said TUC General Secretary Frances O'Grady. The European Union has warned Bangladesh to move quickly to make its factories safer or risk losing privileged access to the country's biggest export market. EU trade commissioner Karel De Gucht has described the conditions as "modern slavery." Bangladesh has promised to recruit additional building inspectors, fix problematic factories and introduce legislation to guarantee the right to union representation and collective bargaining. Using figures collected this week from textile workers' unions in Bangladesh, the union group said it had calculated that doubling the wages of a Dhaka textile worker would add just three cents to the cost of a t-shirt bought in the U.K., where budget fashion shirts tend to sell for anything between $3 and $15. Workers were paid the equivalent of just 18 cents for the six t-shirts they were expected to produce each hour, and it was up to major brands and retailers to ensure that changed, it said. "They are the ones who must change their behavior and encourage their overseas suppliers to pay higher wages and improve working conditions, not UK consumers," said O'Grady. Shoppers have demonstrated outside retailers in Europe and the U.S. and have used social networks to speak out against the unsafe conditions and low wages. But as Bangladesh takes an ever larger share of the global clothing market, consumers are left with few choices. The country is the third biggest exporter of apparel to the U.S. and the EU. Some retailers are already reviewing their dependency on Bangladesh. The Walt Disney Company (DIS) stopped production of branded merchandise in Bangladesh in March in order to improve safety standards in its supply chain.